Travel bookings giant Priceline.com (s pcln) is updating its iPhone app with a service that lets customers book hotels at the last minute. The company said Thursday that its Tonight-Only Deals service is now available for the iPhone (s aapl) and iPod touch. It’s part of the company’s existing Hotel & Rental Car Negotiator that lets customers bid on rooms and cars. The feature only works for discounted three- and four-star hotels, and only for rooms available that night. It’s in 34 major cities to start with, with promise to expand further. Sound familiar? It’s essentially the same concept as mobile last-minute hotel booking app Hotel Tonight, whose latest expansion into vacations I covered Thursday. 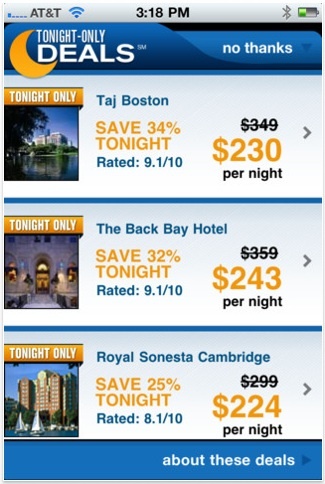 Of course Priceline.com is huge compared to Hotel Tonight, with hundreds of thousands of hotel listings. Hotel Tonight is purely mobile, with no desktop or web equivalent, and in only a couple dozen cities. Are its 750,000 app downloads in nine months making its much larger competitors nervous, or is this market for finding deals on quality hotel rooms at the last minute just now ripe for tapping? We just saw that with the sheer number of people booking of the same night, obviously there’s a market need. In general we’re finding that mobile apps we put out there are being used by a different set of travelers; we a call them ‘the untethered traveler.’ They tend to hold off booking their travel reservations until the last minute…many of them wait until they’re actually in town. It’s easier to target travelers toting smartphones with higher quality, and sometimes pricier rooms, too. Hotel Tonight has a hand-picked selection of “hip, elegant, or basic” rooms to choose from. Priceline says it’s sticking to just three- and four-star rooms for its new service because the statistics of the booking habits of mobile travelers show “they treat themselves well” when on the road. Eighty-two percent of mobile customers chose three-star hotels or higher, versus 75 percent of those who book travel from a desktop computer, according to Priceline’s findings.